Many life-changing innovations and world-firsts emerged in 2004. These include Facebook, the world’s first one gigabyte SD card; Taiwan’s building Taipei 101 — the world’s tallest skyscraper, the first privately-funded human spaceflight as well as the Tertiary School in Business Administration (TSiBA) in the Western Cape, South Africa. Founded on February 27th 2004, TSiBA is a private, not-for-profit business school registered and fully accredited by the Department of Higher Education & Training. Over the last decade TSiBA’s enduring mission remains to graduate entrepreneurial leaders who will ignite opportunity and social change. Over the last ten years TSiBA has provided tuition scholarships to over 1,200 talented young people who would otherwise not have been able to access higher education due to financial or educational constraints. All students are on full, or part, tuition scholarships and contribute, according to their means, to scholarships for their peers. TSiBA’s philosophy of ‘Paying it Forward’ is a vital part of TSiBA’s culture where students who are awarded scholarships are not required to pay back their education monetarily, but rather to ‘Pay it Forward’ by transferring the knowledge, skills and resources that they gain at TSiBA into their communities. In this way, TSiBA’s vision of Igniting Opportunity is realised. Throughout the year TSiBA will be celebrating its ten year milestone with the Power of Ten campaign which highlights the exponential, knock-on effect of TSiBA’s pioneering ‘Pay it Forward’ philosophy. This increases the number of people reached and stretches into the community to break historical boundaries to social and economic empowerment. This phenomenon is transforming the lives not only of students, but their families and communities. TSiBA’s achievements over the last ten years, across six degree cohorts, includes five Mandela Rhodes Scholars, two Kofi Annan Scholarship winners currently enrolled in Masters postgraduate studies in Geneva and Berlin, as well as two final year degree students in the prestigious Allan Gray Orbis Foundation Fellowship programme. It is estimated that current TSiBA graduates will contribute over R5 billion into the economy during their professional careers. TSiBA extends its reach further into the community through the high school learners and entrepreneurs who benefit from the pro-bono services that are offered by the Ignition Centres for local entrepreneurs on both TSiBA campuses. 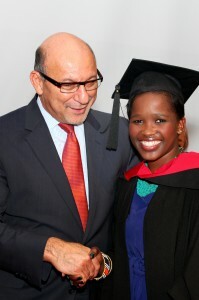 Thokozile Mcopele, 2012 TSiBA Bachelor in Business Administration graduate and 2013 Mandela Rhodes Scholar with Trevor Manual.